An American woman was dragged off a Korean Air flight from South Korea to San Francisco for allegedly refusing to leave a business class seat after "self-upgrading" herself from her economy seat. The incident took place Friday before takeoff from Incheon Airport. A video of the incident was posted on the Korea JoongAng Daily YouTube page, showing the woman resisting as flight attendants attempt to remove her. The woman could be seen fighting with the crew and screaming about nuclear disarmament as airport police officers joined in to get her out of the business class. [post_ads]The passenger can also be heard chanting “U.S. Marshall” and what sounds like “Korean Air stole my passport.” During the struggle, the woman at one point falls but later gets up and is seated in a wheelchair-like conveyance by flight attendants. The scuffle reportedly ended up delaying the flight by one hour and 40 minutes, the JoongAng Daily reported. 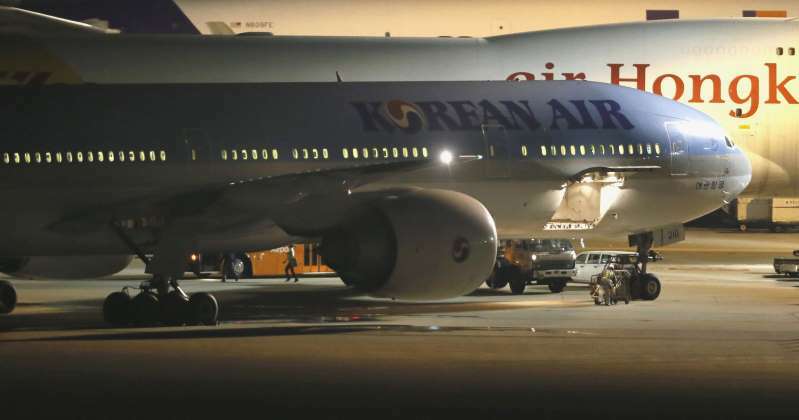 Korean Air told San Francisco Chronicle that the woman passenger ignored police officers' request to leave her seat and became violent during the deboarding process. An investigation is underway into the incident. Footage of the incident is reminiscent of a similar video that surfaced last year in which David Dao, a 69-year-old Vietnamese-American physician, was dragged out of a United Airlines plane after refusing to give up his seat to airline employees. The flight was scheduled to travel from Chicago to Louisville, Kentucky. Due to the use of excessive force to remove him from the jet, Dao suffered a concussion, a broken nose and two knocked-out teeth. He also reportedly required surgery for a sinus problem. The handling of Dao received widespread condemnation, leading to the firing of James Long — a former Chicago aviation security officer who forced Dao off his seat. Dao reportedly received "millions" in settlement from the airline but the exact figure has not been disclosed.